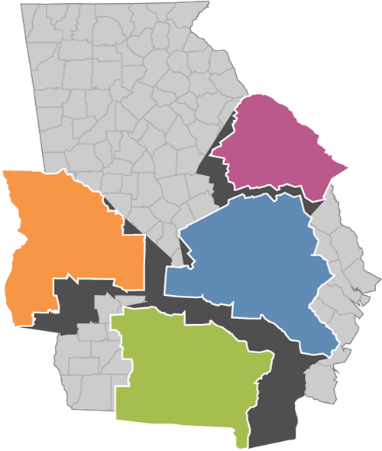 In 2012, voters in three Georgia regions - River Valley (RV), Central Savannah River Area (CSRA) and the Heart of Georgia Altamaha (HOGA) - approved a 10-year one percent sales tax to fund regional and local transportation improvements. The Southern Georgia (SG) Region passed the referendum in 2018. Prior to the votes, regional roundtables of local elected officials, with significant public input, selected projects for each region’s Approved Investment List. Combined, these list represent 1,023 TIA-funded projects. TIA tax collections will continue through 2022 for the original three regions, and until 2028 in the SG Region. GDOT is responsible for the management of the budget, schedule, execution and delivery of all projects contained in the Approved Investment Lists.